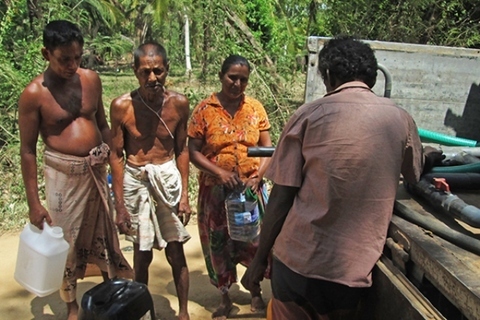 The ongoing drought has severely restricted the water supply to about 550,000 people the areas of Anuradhapura, Polonnaruwa, Moneragala, Hambantota and Ampara. “The Disaster Management Ministry will provide drinking water to those who have been most affected by the drought,” Disaster Management Ministry Secretary, S. S. Miyanawala said at a press conference at the ministry yesterday. "Disaster Management Minister Anura Priyadarshana Yapa visited four districts and met with the divisional secretariats recently to discuss plans to mitigate the drought damage,” he said. The Treasury has allocated Rs. 25 million to each affected district to satisfy the needs and wants of those suffering from the drought. While there is a shortage of drinking water in many parts of Sri Lanka, the country’s agricultural output is very much at risk. It is estimated that between 25-30 percent of paddy cultivation will be damaged by the drought, while the harvest as a whole is predicted to decrease by up to 20 percent. “Water is being consumed the most in the field of agriculture and because of the drought and the water crisis the farmers have been informed to control the usage of the water,” Agricultural Department Secretary, B. Wijayarathne said.Despite these troubles, Govi Sathiya scheduled to take place between October 8-16 will continue. The lack of water is also straining the country’s electricity sector. Low river volume means that hydropower installations produce less energy. “Instead of generating power from water sources, we are using the Norochcholai coal power plant to supply electricity,” Ceylon Electricity Board Chairman Anura Wijayapala said. He added that about 50 percent of the country’s electricity is currently being produced by the Norochcholai plant. Furthermore, demand for electricity is increasing due to the hot, dry conditions across most of the country. While there was much cause for alarm at the press conference, rain is expected in many districts within the next two or three days.